There is a lot more to running a tiling business than simply attending a course and learning how to put tiles on a wall and floor. This is only 50% part of the game. Here at UK Pro Tiling Training, we are a dedicated tiling training centre, specialising in career changing courses. We have one tutor, Darren, who will teach you throughout the whole of your tiling course. Darren is the owner of UK Pro Tiling Training and is a tiling industry expert, with over 32 years of self- employed experience to pass over to you. What more could you ask for? UK Pro Tiling Training not only delivers top quality tiling instruction, it also gives you all the knowledge and know-how to start a tiling business. Think about how much money you will lose if you are a tiling expert, but nobody asks for your services because your marketing skills are poor, or your sales skills are not up to scratch. At UK Pro Tiling Training, we remind our students that when estimating a project it is important to remember that the customer hasn’t seen any of your past tiling work, so it all comes down to what you say during your estimate as to whether you get the business or not. Unfortunately, simply being a good tiler is not enough. It is important to acquire effective business skills. UK Pro Tiling Training has been delivering quality fast track career changing courses for over 12 years and have taught thousands of learners from all over the UK and Europe. Our learners travel because of our strong reputation and excellent advice we give. The key to running a successful tiling business lies in the 5 key essential skills below that we also teach on our tiling course. Take any one of these skills away and you will fail. 1. Marketing and advertising (finding work). 2. Sales skills (the ability to sell your services to your customer). 3. Personality connections (making sure you get on with your customer). 1. We have over 30 years experience in the tiling industry, as well as 12 years delivering professional tiling training courses at the highest level possible. 2. We are the only dedicated professional tiling training centre in the UK. 3. Our courses are hands-on and include a lot of practical challenges. 4. 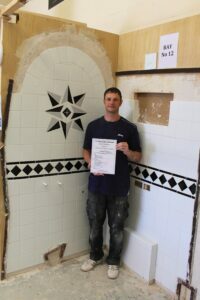 Our tutors are fully-qualified in L3 NVQ Tiling. 5. We provide expert advice on how to find work, price jobs and how to start your own tiling business. 6. We receive massive amounts of positive feedback and testimonials over the web. 7. 1000s of learners have already successfully trained with us, from all over the UK. 8. We provide one of the best tiling manuals (50 pages, 10,000 words) for you to take away for reference from your tiling course, covering what to do when you leave, all chaptered for easy reading. 9. We offer an aftercare service, free of charge, following your course. 10. Stay in local accommodation from £25 per night. 11. We deliver a no-nonsense, fast track tiling training course with proven programs which work and, ultimately, deliver the goods. When booking a course with UK Pro Tiling Training, you are not just paying for a course, you will also have access to our aftercare telephone and email lines, where you can contact us for advice on anything relating to the course or a tiling job. Our aftercare service can offer you an added piece of mind to support you after you leave the centre, and is totally free of charge. Re-training for a career is not cheap, there is the cost of the course and the time off needed plus accommodation costs. Think it out and spend your money wisely, choosing a tiling course with UK Pro Tiling Training is not only about taking a tiling course, its the full package, it is an investment into your future as a wall and floor tiler. How much could you earn as a tiler? Professional Tilers will usually charge around Â£20 per metre square for fitting ceramic tiles or £180-£250 per day (In the north) or around £35 per metre (in the South) for general domestic tiling work, good tilers are usually always in demand. Think of an average bathroom which is roughly 25 square meters on the walls and 8 square meters on the floor ( 3 days work= £800), a conservatory floor tiling job would be roughly 12 square meters, this should take only a day to complete (£300). Kitchen splash backs (£200-£250) for the day, both plus material profits. In addition to these rates above you can add extra profit by selling all the materials and adhesives the job requires to your customers due to buying with discounts through your trade accounts, so if you are thinking of starting a business this is earnings you could expect once you get established and up to speed, a £1000 per week could be achieved. All the pictures you see on this site were taken of past learners on our short fast track tiling courses just to show you what you yourself will be able to achieve in a short space of time. It doesnt take long for you to recover your training costs of the course and you will have trade skills that will last a lifetime. What have you got to lose?